Too cold, too wet, too windy…find the outerwear that’s right for your ride. Outerwear has come a long long way since your mom was pinning your mittens to your puffy jacket. Hi-tech fabrics, performance and comfort design features, and even an appreciation for a a bit of fashion are all available. When choosing outerwear, it’s important to try and determine what conditions you’ll be encountering on your ride. The three biggies that confront you are rain, wind, and cold. While there’s outerwear for nearly every condition, all have some cross utilization possibilities. But, remember, no one piece can do it all without some sacrifices. That’s where choosing the right piece of gear or combination may make all the difference. The main ingredient for dry comfort is some form of water repellant or waterproofness. These fall into two categories: Durable Water Repellant (DWR) finishes or waterproof hi-tech fabrics like Goretex or eVent/Elite. Most more expensive outerwear, use a combination of both, possibly even in layers as part of the design. 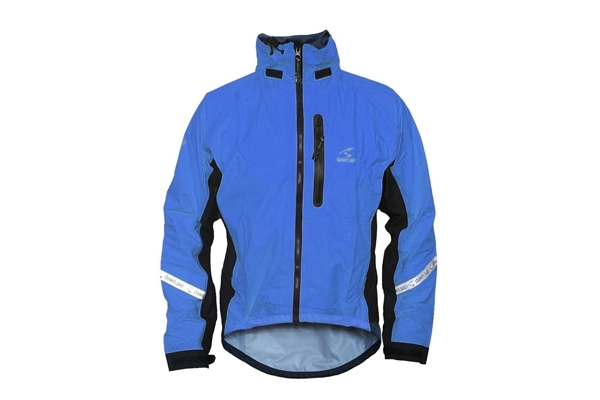 Couple this with venting such as pit, collar, and neck zips and the jacket becomes a performance tool that keeps you dry and regulates your body temperature during exertion. Usage and the clothing you wear underneath also play a role. Some jackets are made to be worn over bulky cold weather clothing while others are tailored to be worn over a thin base-layer or cycling jersey. Wearable and practical commuting shorts/pants and why you need them. What if you took all the benefits of a cycling kit and combined it with casual and stylish active wear? You’d have Swrve, Club Ride and Chrome. These three companies have brought active cycling gear to a whole new level. Developing shorts, knickers and pants that not only feel comfortable on the bike your can comfortably transition from your bike to work or out to dinner and not look like that guy… you know the one at Starbucks in his full kit! What’s the big difference between theses brands and regular active wear? Well to start, the fabric. All these brands are using stretch cotton and hi-tech fabrics, which is designed for on bike use clothing. If you are not aware of what stretch cotton is, you’re about to fall in love! Stretch Cotton is a blend of cotton and Lycra which provides all the comfort and softness of cotton but also allows for some stretch and flexibility. This equals a garment that is not only comfortable, but allows for easy movement in shorts and or pants. Just like your bib, but without looking like you’re headed to climb alpe d’huez. Stretch cotton will change the way you feel and dress on your daily commute. No more bringing a change of clothes to work. Now you will be able to comfortably ride into the office, park your bike and fit right in with your colleagues in your stretch cotton. Trust me, its more comfortable than the slacks or jeans you’re wearing now and looks nicer as well. These active wear companies are going to change the way you dress and more importantly feel in your day to day clothing. Comfortable, windproof, water resistant clothing that looks good. This is a movement! You will be seeing larger companies soon jump into the mix. Levi’s is entering the game with their own stretch cotton blend; this is not a fad it is going to change how you expect your clothes to feel. After we started receiving our first shipments of these brands, our staff quickly started buying them up before we even got them on our site! In all of my years riding, racing and commuting I have never been as comfortable in my new urban kits. This is quality cycling wear that just happens to look nice off the bike as well. Once you find out how articulated knees, gusseted crotches, and stretchable materials work for you, you’ll never look back. Cycling tops are designed to be comfortable, functional, and maybe even stylish! 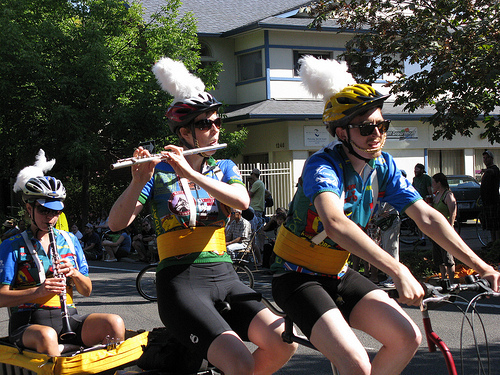 Everyone has seen bright multi-colored bicycle specific jerseys. And, they’re great for club rides, advertising, or just having a Walter Mitty journey in your own Tour De France. But, cycling tops have come a long way and are now more breathable, stylish, and still provide some unique design features that make them great choices for cycling. Before you start shopping, there are some things to think about. What kind of cyclist are you? What are your needs? Do you need to change once you’re at you destination or do you want to be able to roll straight into your destination without worrying about changing? What kind of weather will be out there? Are you afraid of the dark? The nice thing about contemporary bicycling clothing is that manufacturer’s designers are invariably cyclists themselves. They design with riding a bike in mind. And, they know what works. Today’s cycling clothes take the approach that your bicycling lifestyle doesn’t have to interfere with your activities off the bike. So, going to the store, commuting to work, or just meeting up with friends at your favorite spot doesn’t have to have the flavor of the finish line at the Paris-Roubaix. Cycling clothing has become “lifestyle” clothing – for wear on and off the bike. Riding your bike is all about freedom, comfort, and still looking good. Contemporary cycling clothing seeks to satisfy these qualities through functional design, technical fabrics, all with an eye toward projecting a casual style. Designers look to make shape and fit work for cycling posture and position. They build in pockets, flaps, and ventilation features that are bicycling centric. Technical fabrics will often provide moisture management, wicking control, quick drying qualities, stretch, and feel good next to your skin. Tops may have to work with other pieces of clothing as well. How they work with bicycling pants, baselayers, and jackets is also part of the equation. What was the first thing your mom would say before you went out to ride your bike? Well if you were born anytime before 1985 probably nothing, or maybe just, “Be home before dark.” BUT! IF you are too young to remember Mork and Mindy, your mom was probably screaming, “DON’T FORGET YOUR HELMET!” Of course now, as adults, we all know better and wearing a helmet is the only sensible thing to do. There is no better way to protect the sanctity of your brain than to cover your dome in a good quality helmet.So what are some of the things we look for when choosing a helmet. Well fit is certainly one very important criteria. Beyond fit though, what else goes in to choosing the right helmet for you? Some of the qualities that people look for in a helmet are weight and ventilation. Does it have a visor? Is it best suited for warm or cold weather? Can I integrate headphones (yup even that is possible with some helmets)? With so many things to consider it can sometimes be hard to sift through all the helmet options. In the most basic sense helmets are all about the same. They fit over your head, strap around your chin, and, well that’s about it. And while that’s the same for most all helmets its pretty obvious that we wouldn’t want to use a football or auto racing helmet while cycling. Sure it will protect your head but at what other cost? In the cycling world we want to not only protect our head as much as possible but we don’t want to sacrifice visibility. If we are to be riding for long periods of time we don’t want to have our scalp over heating. If we are prepping for the Tour de France or the Kona world championships weight is probably a pretty big issue. All of these factors go into the design of a great cycling helmet. What goes in to the modern cycling helmet? In general most helmets are made of a solid core of poly styrene with a hard plastic outer shell. Most also have a nice soft liners, perhaps even removable or interchangeable to create a more custom fit. Of course there is also the chin strap to make sure that helmet stays in place. Beyond just the construction of the helmet there are also some things which are unique to different helmets. Some helmets are better suited to mount lights. Others are very heavily vented for the distance rider. When choosing a helmet think carefully about which features you will want before deciding. Touring Shoes the toughest shoes for cycling around. Touring Shoes are built for mountains, mud, rocks, sand and any other off-road terrain but can be worn as a normal shoe for day to day life. What makes Touring Shoes different from Commuting Shoes? The most common difference is the carbon rubber on the bottom. The rubber bottom are more aggressive and are cut like a off road tire to help keep you up right! But don’t worry, Touring shoes still keep all the benefits of commuting shoes by help with a more efficient pedal stroke and lets be honest, touring shoes are waaaaaaay cooler and being being cool is still cool, right? Touring shoes can go anywhere. Camping? Riding? Touring? Mountain Biking? Challenge Accepted. These shoes can do it all. You’ll also want to make sure that your shoe has really good ventilation, so your feet can breath and a good stiff sole will also help keep your power pushing through your legs to your pedal. Don’t be limited, Touring shoes can be used off the bike for just about anything, these aren’t your traditional touring shoes that are clunky and hard to walk in, these babies are comfy! Commuting shoes are one of the must haves for any bicycle rider, Commuting Shoes differ from your normal shoes because they have the ability to attach to pedals making your pedal stroke easier. The commuting shoes comes with hardware that is already installed on the outside of the toe box gum area and are designed to clip into your bikes pedals. Why is this good? Using commuting shoes that clip in helps move your energy in your legs down or up pedal to help drive your power through the pedal stroke to ensure a efficient and powerful pedal stroke and that means you be able to ride easier and keep a steady pace while riding around town or into work. Commuting Shoes come in all shapes and colors. What type of job do you have? Do you work in that suit and tie workplace then you might want to check out the Quoc Pham shoes and roll into work with style. Or are you out on a retail floor selling bikes and need something to get you through the day and be comfortable on your feet then you should check out the Chrome Shoes and keep the digits flowing! The best part is both shoes you can keep on all day and hop on your bike and ride home. Whatever shoe you decide on, you be sure to notice a difference while riding and all the high fives you’ll get for wearing the most awesome shoes known to man. Now go out there, clip in and ride the world! Mirror mirror on my head, if I don’t use you I may be dead. Mirror mirror on my bar, each time I use you I do ride far. Silly rhymes aside, to use a rear view mirror, or not, can he a hot topic in the cyclist community. Some riders swear by them and will never ride without. Some riders just can’t seem to get the knack of them, while others can’t even find one that simply doesn’t annoy them. Regardless of which camp you fall in to, hopefully we can give you some insight on the different types of rear view mirrors and why one may be just right for you. If you are in the market for a mirror its time to decide which type of mirror to use. In general there are two main types of mirrors on the market. The first type that you will commonly see is the helmet mounted mirrors. Sometimes these can/will also be mounted to the riders glasses. This is a very popular type of mirror because it is light weight, can be easily moved from helmet to helmet (or glasses to glasses) and it leaves valuable real estate on your handlebars free for other items. One notable downside to this type of mirror is that is is small. Some find it difficult to get a good view behind them. Another complaint that some have is that it is a constant distraction hanging out just inside your periphery. While both of these critiques are valid, most riders find them less significant as they get used to riding with and using the mirrors. 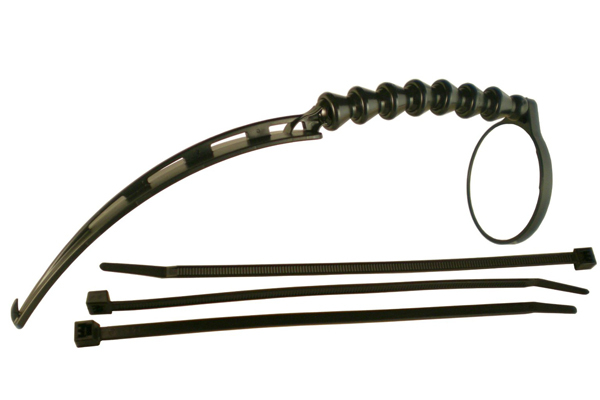 The next most common type of cycling mirror is the handlebar mounted variety. Upsides are usually larger mirror surface area for better visibility. It is also a more natural action for those of us used to driving cars. These can also sometimes be easier to adjust to suit your needs. The biggest downside is that it takes up, what can be, valuable handlebar space. Sometimes after your cyclometer, phone, handlebar bag and lights there just isn’t room for anything else on your bars. Finally, this is very often a more permanent solution. It is not always easy to move the handlebar mounted mirrors from bike to bike. Now that you know a little bit more about the different types of mirrors that are available, browse around and try to find the very best cycling rear view mirror, for you, that you can find.